Establishing the feasibility of projects is a critical factor in business success. Many factors may be involved and invariably luck can and probably will play a hand. Many new projects which have passed countless feasibility studies have been sunk by unexpected events such as flood. fire, burglary, changes in legislation, plague, demographic shifts, an inability recruit and/or keep suitable staff, the failure of a major customer, seasonal demands, health scares, product recalls due to poor quality, withdrawal of financial support, weather, new technology and poor management to list but a few. Many projects of course can pass feasibility tests and studies and be brought undone by sheer incompetence or downright dishonesty. A key factor in any feasibility study must be ensuring that you are dealing with correct facts, correct assumptions and up to date financial data. Many projects fail because assumptions were based on incorrect facts. 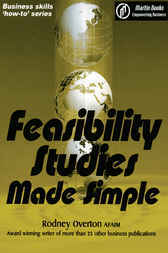 In this book we have endeavoured to provide a diverse range of thought provoking and stimulating information and checklists on which a professional quality feasibility study can be structured. We currently have a range of more than 100 books, CD ROMs and Training Facilitators Manuals available, covering areas of business such as Business Administration, Business Planning, Finance, Human Resources, Management, Marketing, Sales and Small Business. We hope that the material presented will offer encouragement, suggestions and resources to support new and effective ways of leading and succeeding in your chosen field. We currently have a range of more than 100 books, CD ROMs and Training Facilitators Manuals available, covering areas of business such as Business Administration, Business Planning, Finance, Human Resources, Management, Marketing, Sales and Small Business. We also have available a Training Facilitators manual on this topic.